WASHINGTON (Reuters) - The U.S. House of Representatives on Thursday narrowly approved a bill to repeal and replace Obamacare, handing Republican President Donald Trump a victory that could prove short-lived as the healthcare legislation heads for a likely battle in the Senate. The vote to undo major parts of former President Barack Obama's signature domestic achievement, which enabled 20 million more Americans to get health insurance, was Trump's biggest legislative win since he took office in January, putting him on a path to fulfilling one of his key campaign promises as well as a seven-year quest by Republican lawmakers. It marked a reversal of fortune for the Republican president who suffered a stunning defeat in late March when House Republican leaders pulled legislation to scrap Obamacare after they and the White House could not resolve the clashing interests of Republican moderates and the party's most conservative lawmakers. Trump has called Obamacare a "disaster" and congressional Republicans have long targeted the 2010 law, formally known as the Affordable Care Act, calling it government overreach. But despite holding the White House and controlling both houses of Congress, Republicans have found overturning Obamacare politically perilous, partly because of voter fears, loudly expressed at constituents' town-hall meetings, that many people would lose their health insurance as a result. With Thursday's 217-213 vote, Republicans obtained just enough support to push the legislation through the House, sending it to the Senate for consideration. No Democratic House members voted for the bill. Democrats say it would make insurance unaffordable for those who need it most and leave millions more uninsured. They accuse Republicans of seeking tax cuts for the rich, partly paid for by cutting health benefits. As Republicans crossed over the vote threshold to pass the bill, Democrats in the House began singing "Na na, na na na na, hey hey hey, goodbye," a rowdy suggestion that Republicans will lose seats in the 2018 congressional elections because of their vote. "I went through two years of campaigning and I'm telling you, no matter where I went, people were suffering so badly with the ravages of Obamacare," Trump said. "We are going to get this passed through the Senate. I am so confident." Later, after traveling to New York, Trump told reporters there could be changes to ensure passage by senators. "It could change a little bit. It could be maybe even better. It's a very good bill right now. Premiums are going to come down substantially. Deductibles are going to come down," he said. The treatment of people with "pre-existing" conditions was one of the central issues in the House debate on the bill and is sure to resurface in the Senate. 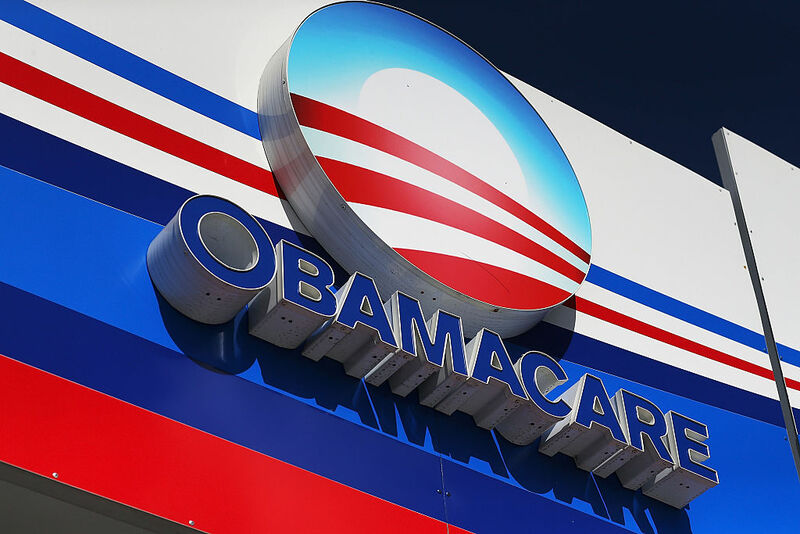 Health insurers, such as Anthem Inc, UnitedHealth Group Inc, Aetna Inc and Cigna Corp, have faced months of uncertainty over healthcare's future. So have hospital companies, such as HCA Holdings Inc and Tenet Healthcare Corp.
On Thursday, Aetna shares closed up 0.8 percent, Humana shares rose 2.2 percent, and UnitedHealth Group shares were up 0.9 percent. Cigna shares fell 0.2 percent. HCA Holdings Inc shares rose 0.7 percent and Tenet Healthcare Corp shares closed up 1.8 percent. Some analysts said the modest share moves reflected the fact that the final version of the bill had more funding in it that would help insurers and hospitals. The Republican bill would repeal most Obamacare taxes, which paid for the law, roll back the Medicaid expansion and slash the program's funding, repeal the penalty for not purchasing insurance and replace the law's tax credits with flat age-based credits. "I've already made clear that I don't support the House bill as currently constructed because I continue to have concerns that this bill does not do enough to protect Ohio's Medicaid expansion population," said Republican Senator Rob Portman. While the bill's fate in the Senate is uncertain, its House passage could boost Trump's hopes of pushing through other big-ticket items on his agenda, such as tax reform. "Anything that they (the Republicans) get done, that they accomplish, popular or unpopular, will show that they have the ability to make progress and to get things done and work together," said Randy Frederick, vice president trading and derivatives at Charles Schwab in Austin, Texas.